Coconut water is not the same thing as coconut milk! They are both derived from coconuts, but they are diverse products. In contrast to our coconut milk, which is obtained from the flesh of harvest-fresh coconuts, coconut water is the natural, clear water inside harvest-fresh green coconuts. The young, green coconuts are harvested especially early exactly when the coconut water has the most nutritional value. The harvest-free coconuts are processed straight away. The coconut water is heated gently and filled into containers directly***. ***Because of how it is processed, it is not possible to produce coconut water that is suitable for a raw food diet. In harmony with nature and with respect for food Sun-ripened coconuts are harvested by our smallholders in the Philippines every day. The harvest-fresh water of these young, green organic coconuts is the sole ingredient in our delectable and natural premium organic coconut water. In addition to fundamentals such as the superior quality of our harvest-fresh organic coconuts, our gentle yet swift processing methods performed within 72 hours of harvest result in our coconut water being extremely valuable biologically and characterized by fresh coconut flavor. Our delicious organic coconut water is filled into containers under the highest hygienic standards right on site in the Philippines. We would like to support the smallholders there which is why we choose not to fill large tanks here at German dairies. free of preservatives and anti-oxidants, e.g. 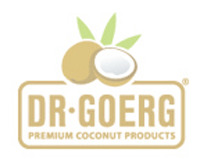 Dr. Goerg Premium Organic Coconut Water is best when stored in the refrigerator. Shake well before opening. Use within 2-3 days of opening. Das ist mein Lieblingskokoswasser!\nIch habe schon viele durchprobiert.\nDieses hier schmeckt am besten! Das Bio-Kokuswasser schmeckt gesund, frisch und lecker. Ich trinke es pur und genieße jeden Schluck. Das Kokoswasser schmeckt mir hervorragend und ich halte die Qualität für ausgezeichnet. Die Lieferung : prompt. Einen Stern Abzug wegen der Hochpreisigkeit des Wassers. Sonst würde ich dies regelmäßig bestellen. Schmeckt frisch und voll! Bestes Kokoswasser, das ich kenne. Visit us on Facebook, Google + and Twitter and learn more about recipes, news and regular raffles. Sign up for our free newsletter to receive the newest deals and get a 10% voucher. Call us Monday to Thursday from 08:00 to 17:00 and on Friday from 08:00 to 15:00. Delivery with DHL at € 9.95. Free delivery for all orders over € 69.